The Cane Bay Cobra Choirs will present their Annual Madrigal Dinners on December 14th and 15th at 7 p.m. (Doors at 6:30); and December 16th at 5 p.m. (doors 4:30). 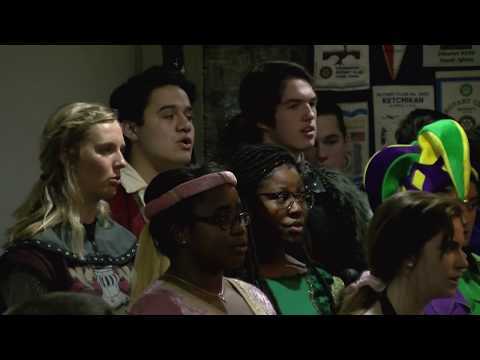 The Madrigal Dinners are a Renaissance themed dinner theater show held at Cane Bay High School and feature the award-winning Cane Bay Cobra Chorale. The video above is from a "warmup performance" the Cobra Chorale provided the Summerville Rotary Club this week. This year's show is entitled "Robin Hood & His Merrie Men of the Round Table" as was written by CBH student Jesse Stratford. Robin Hood and his merry men are caught in the castle stealing from the King. During their escape Robin Hood knocks his head and gets amnesia. Prince John, on the outs with his father the King, convinces Robin Hood that he really steals from the poor to give to the rich in an effort to retrieve the King’s stolen goods. Through the process it is found out that things are not as they appear, or who they appear to be. Tickets for the Annual Madrigal Dinners are $30 per person and include a 3-course meal and the show. Advanced tickets must be purchased for this show. The 3-course meal consists of vegetable soup with Logan's Roadhouse roll, Smoked Chicken Leg and Quarter with roasted green beans and potatoes, and apple pie a la mode for dessert.